The Gulf of Mexico 2018 was a 23-day telepresence-enabled expedition to collect critical information and acquire data on priority exploration areas identified by the ocean management and scientific communities. 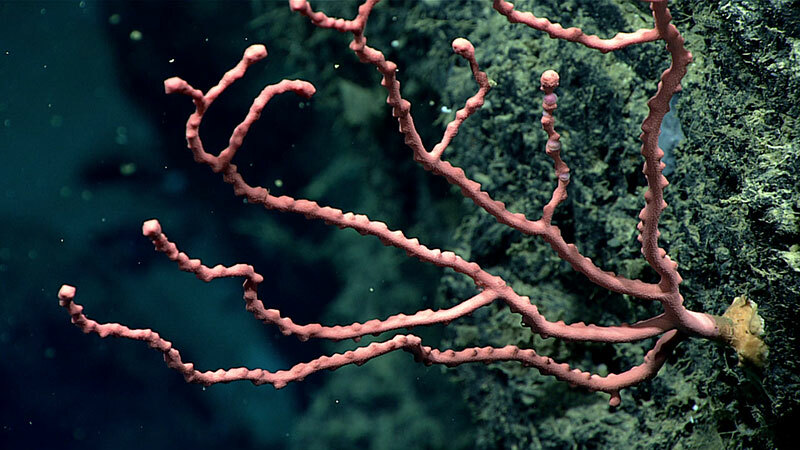 Habitat is very important to all organisms, and deep-sea octocorals are no exception. The series of dives we have accomplished in the Gulf of Mexico have shown some stark contrasts in the animals we observe when traversing sediment-covered seafloor versus exposed hard substrates. As members of the sessile fauna, octocorals live more-or-less attached and fixed in place in their habitat. As such, they need food to come to them. Accordingly, they have a variety of adaptations for capturing their food from the water column. In general, we can consider them as suspension feeders. Over the last few days, you may have heard comments about how lucky we are to be able to dive in this area of the Gulf of Mexico. 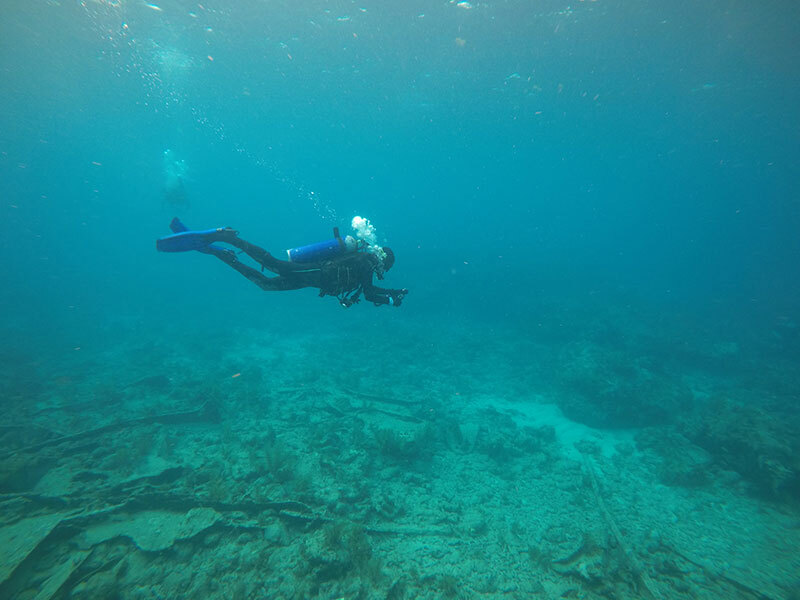 There is great difficulty in diving on the southern portion of the Western Florida Escarpment, as currents are particularly strong in this area. Past dive attempts by the Okeanos Explorer and other programs were prevented by the full force of the Loop Current – flowing at four knots. 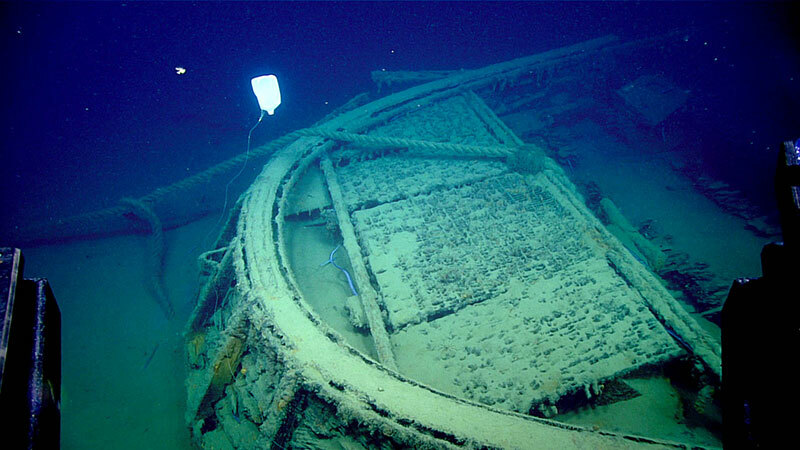 But on the Gulf of Mexico 2018 expedition, we have finally been fortunate to find favorable conditions! 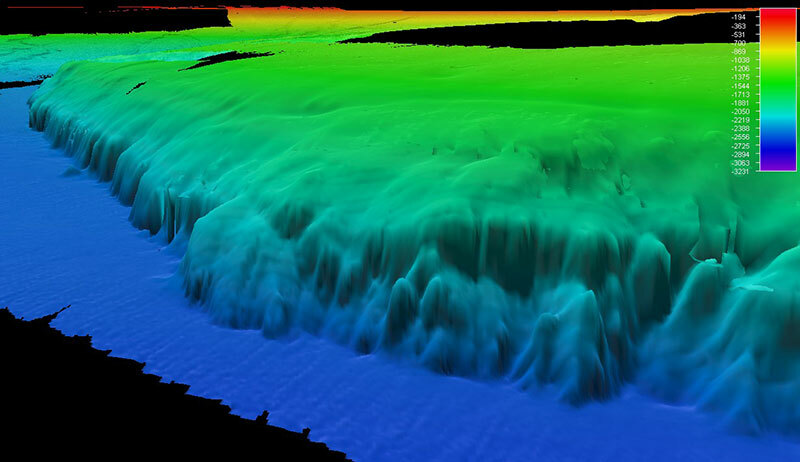 The Florida Escarpment is a very steep slope where the seafloor plunges rapidly from the relatively shallow waters of the west Florida continental shelf – less than 100 meters (~330 feet) deep – to the abyssal plain of the deep Gulf, over 3,000 meters (~9,840 feet) deep. The escarpment lies between 250 and 350 kilometers (~155 and 215 miles) off the west coast of Florida and extends from De Soto Canyon in the north to the Florida Keys in the south. 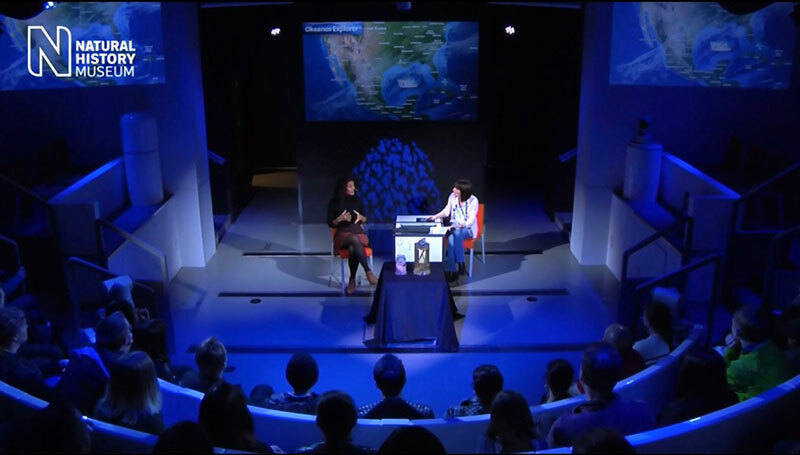 International Gulf-Stream Telepresence—Beaming Okeanos Explorer Imagery Across the Pond! Most of us know that NOAA Ship Okeanos Explorer is a very special ship for numerous reasons: it focuses on exploration of the deep unknown, it has remotely operated vehicles (ROVs) that are able to capture stunning imagery, and it has a great team both onshore and offshore. But the most special feature of the Okeanos Explorer is its ability to beam the deep sea to pretty much anywhere in the world with an Internet connection via telepresence. And on Friday, 27 April 2018, we had a great example of telepresence at its finest. Abyssal Stars from the Gulf of Mexico: A Bounty of Surprises! 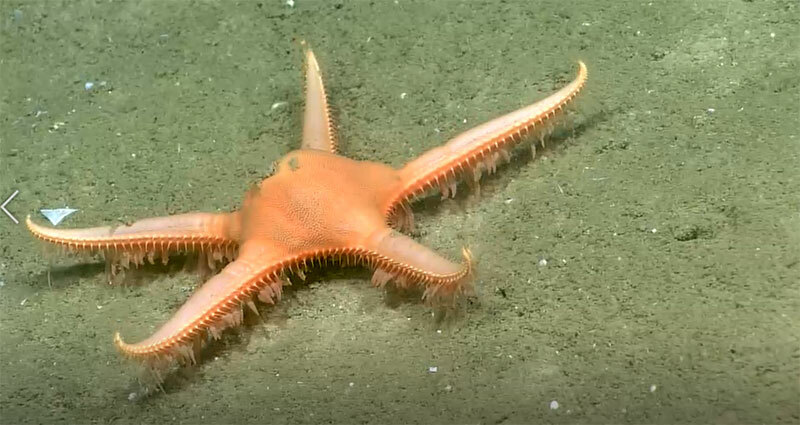 As one of the most heavily studied areas in American waters, Chris Mah expected that most NOAA Ship Okeanos Explorer observations in the Gulf of Mexico would likely be species of sea stars that were reasonably well known—or at least familiar. He was delighted to be wrong! 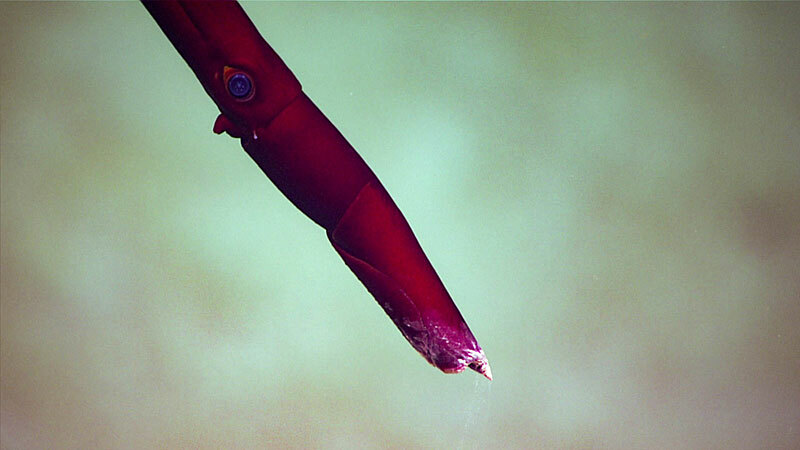 Here are five Okeanos Explorer observations that he has found particularly interesting thus far. 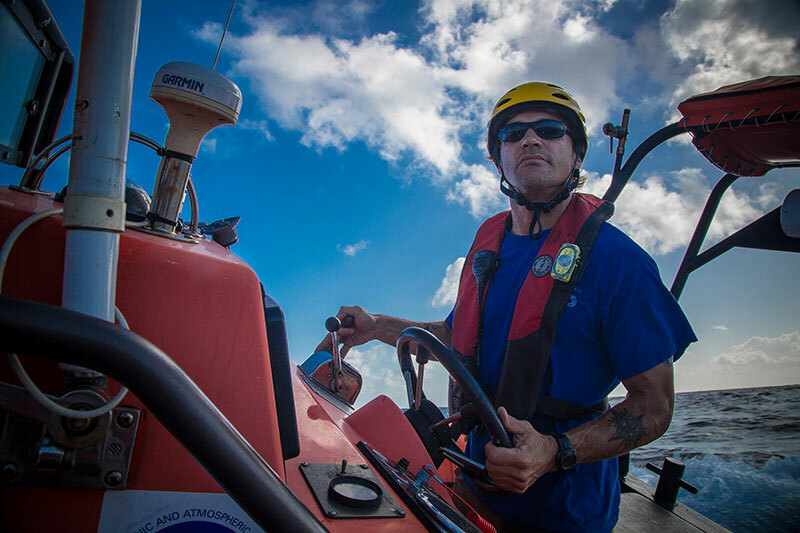 NOAA Ship Okeanos Explorer Chief Boatswain Jerrod Hozendorf's adventure and love affair with the ocean began as a small child, holding his grandfather’s and father’s hands while and being tossed about in the surf zone at Myrtle Beach, South Carolina. To say the ocean is in his blood would be an understatement. 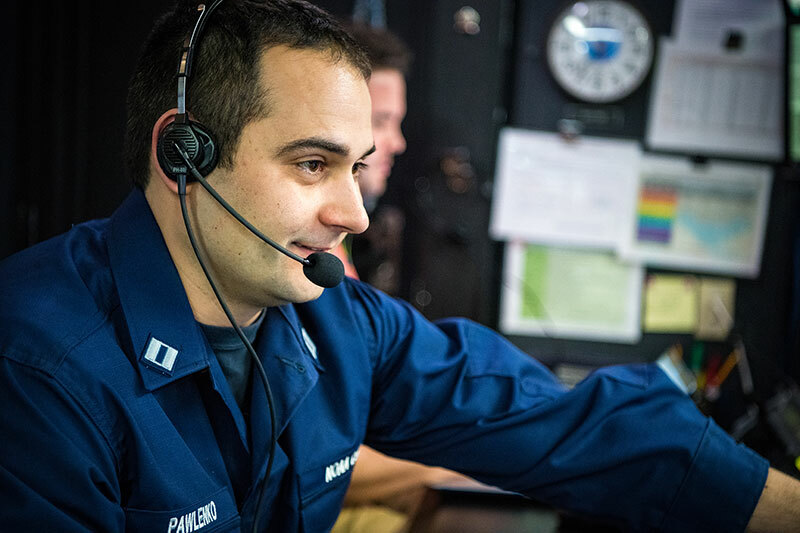 Learn more about the path that led him to working on the Okeanos Explorer. 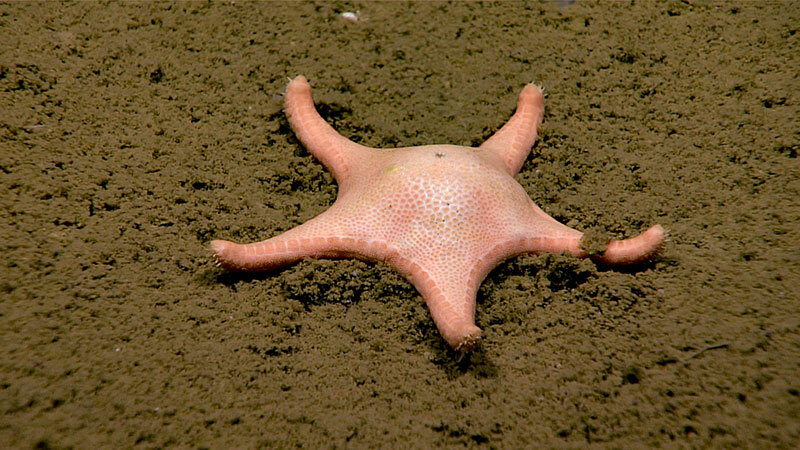 This deep-sea mud star, Dytaster insignis, is a species which occurs in the true abyss, 2,515-3,530 meters (8,250-11,580 feet)! Although this individual was observed on the surface, it and other related “mud star” species are often seen buried just below the surface of muddy or sandy bottoms. This and related species are commonly collected with their disks engorged with mud. 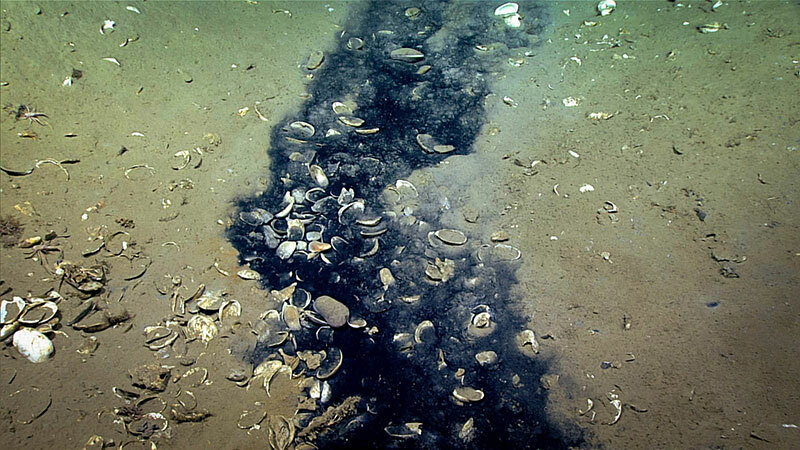 They have swallowed the sediment in order to devour potential snails and clams as well as other small organisms. Halfway through Dive 06 of NOAA Ship Okeanos Explorer 2018 expedition to the Gulf of Mexico, remotely operated vehicle Deep Discoverer crested a low rise on the seafloor and peered into the sediment-lined depression below. At the base of the depression was a small pool filled with dark blue water and surrounded by the bright white shells of dead mussels. The scientists and engineers in the control room immediately recognized the feature as a brine pool. This video shows the holothurian Enypniastes eximia deposit feeding on the West Florida Escarpment at more than two kilometers (1.25 miles) depth. 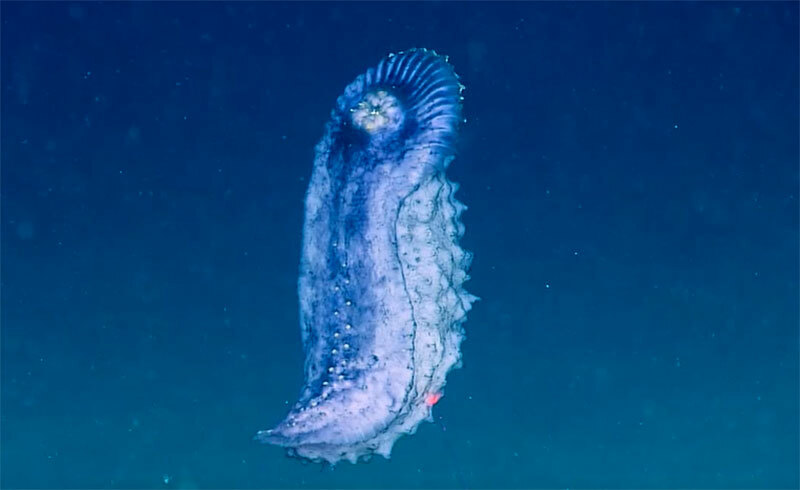 The video has been sped up five times faster than normal so that you can clearly see how the sea cucumber grabs “fistfuls” of sediment using modified tube feet that encircle its mouth. 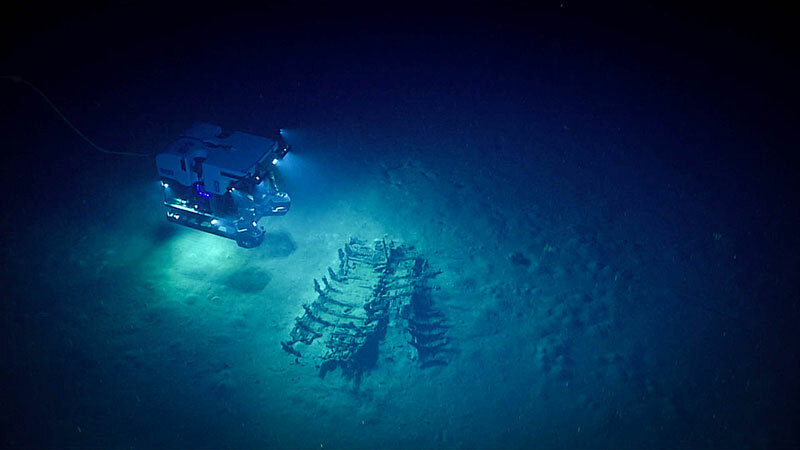 In preparation for the NOAA Ship Okeanos Explorer Gulf of Mexico 2018 expedition, the scientific community was tasked with proposing previously unexplored sites in the Gulf with the potential to reveal new geologic features, biological communities, or archaeological discoveries. 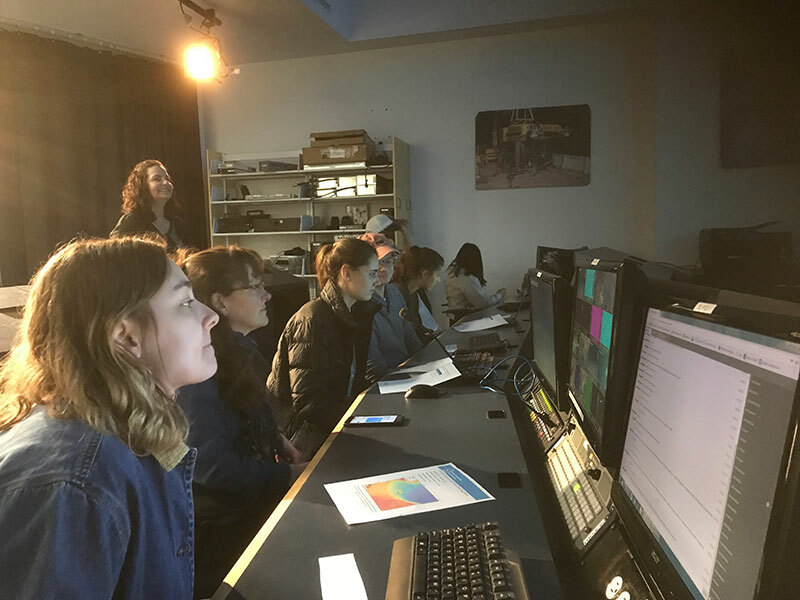 As part of this effort, Boston College Professor Heather Olins and her upper-level deep-sea biology class were invited to submit two dive site proposals to the NOAA Office of Ocean Exploration and Research for consideration. 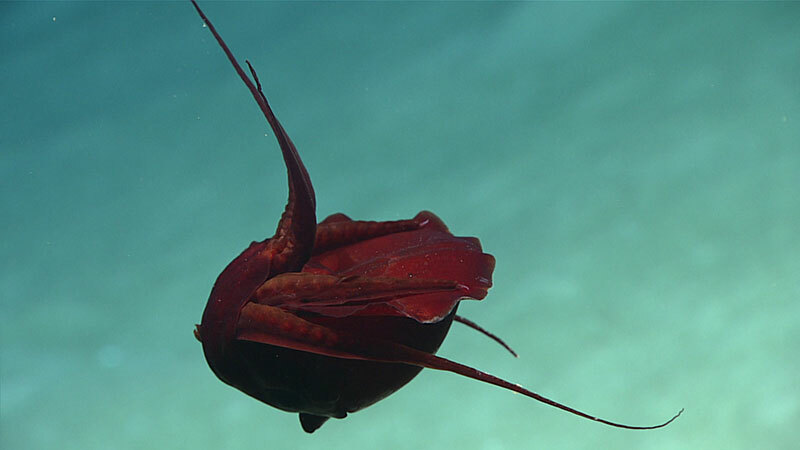 Dive 04 was remarkable for someone like Dr. Mike Vecchione who is particularly interested in pelagic mollusks, including squids and the swimming snails known as pteropods, or sea butterflies. 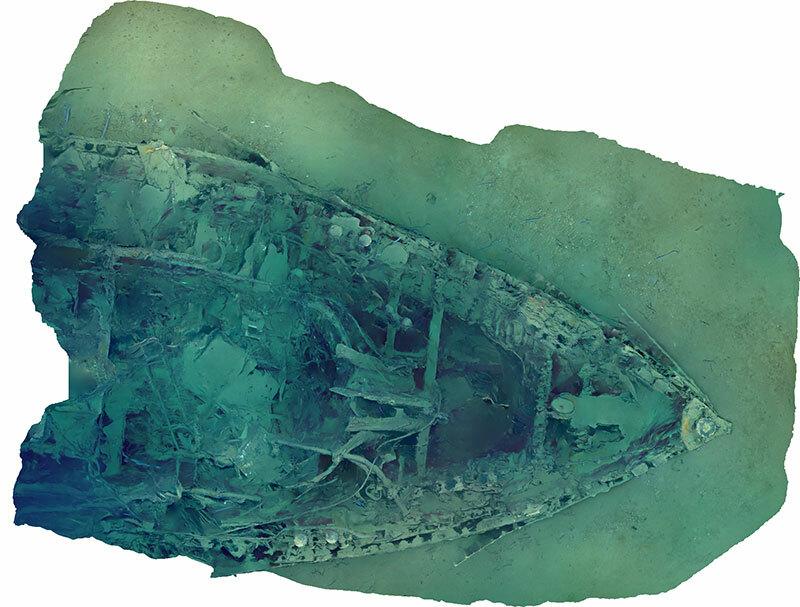 Photogrammetry has become an empowering technique for documenting underwater features or sites in 3D. The combination of relatively straightforward image acquisition protocols and the ability to render both geometrically accurate and photorealistic models using readily available software has made the technique popular. During the Gulf of Mexico 2018 expedition, we have encountered many deep-sea holothuroids (sea cucumbers) that not only swim, but rise, sink, and hover. These behaviors suggest that some species are specially adapted to manage their buoyancy (the force that allows something to float, sink, or remain neutral in a liquid) remarkably well. How do they do it? In the ocean, one of the many detrimental environmental problems is marine debris. Marine debris is defined as any persistent solid material that is manufactured or processed and directly or indirectly, intentionally or unintentionally, disposed of or abandoned into the marine environment or the Great Lakes. 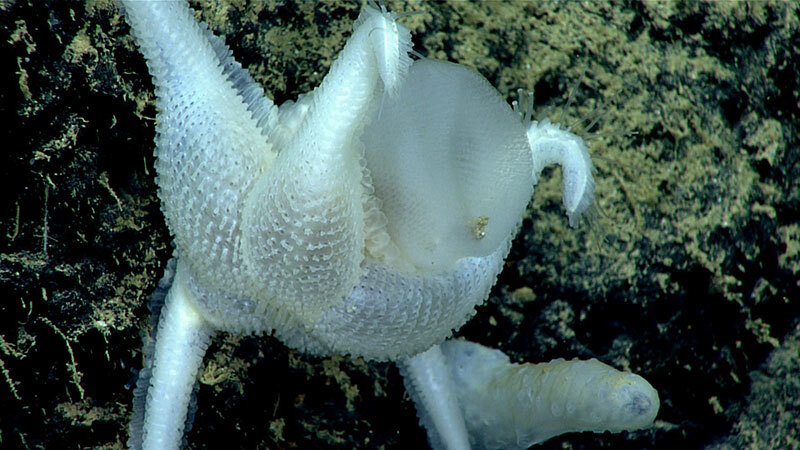 You may wonder what this has to do with NOAA Ship Okeanos Explorer, since we work exclusively in the remote deep sea. As part of our NOAA science and engineering objectives for this expedition, we planned for two engineering dives to shakedown remotely operated vehicle Deep Discoverer in both shallow and deep water. We strategically planned these engineering shakedown dives near cultural heritage sites, in case we got ahead of schedule and had time to visit shipwrecks as well. We thought this would be a good way to increase morale on the ship and still meet our objectives. 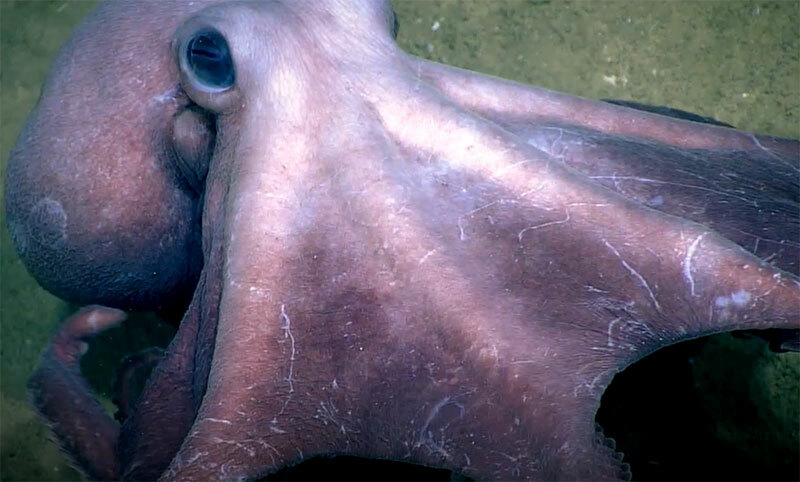 While exploring an unidentified shipwreck during Dive 02, we encountered two octopods, Muusoctopus spp., exhibiting unusual behavior as they appeared to wrestle for den space. As we departed from Pascagoula, I had butterflies in my stomach. 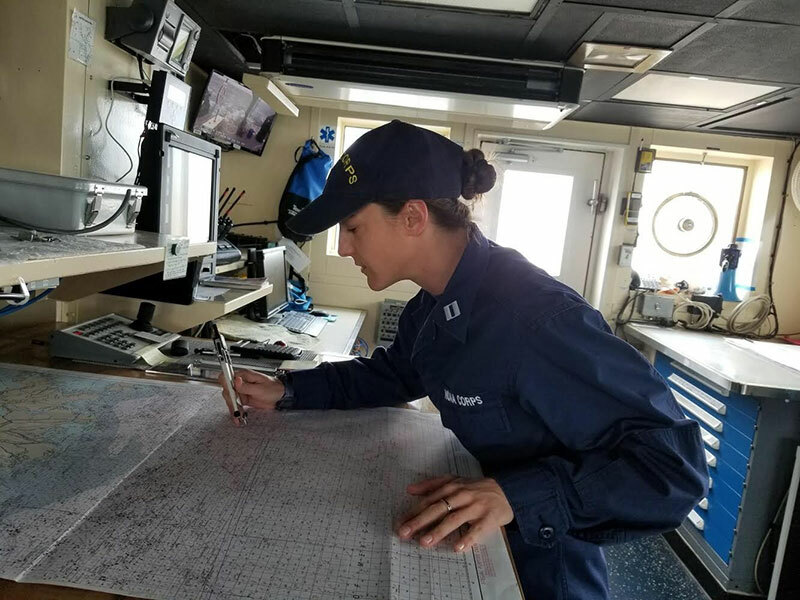 The excitement of discovery is what NOAA Ship Okeanos Explorer is known for and I am thrilled about my new assignment as the Operations Officer aboard this ship, exploring the deep sea on this and future expeditions. 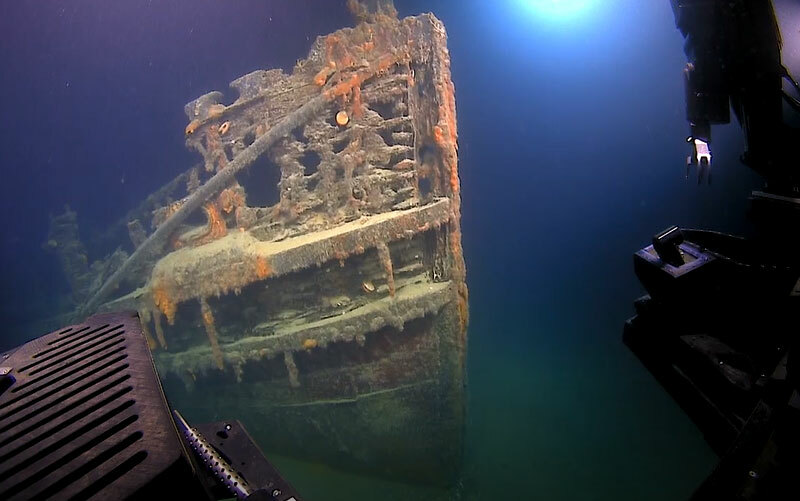 Looming out of the gloom in the deep water of the Gulf of Mexico, the tug New Hope appears as a long forgotten crumbling relic. With the bow riding proud and a towering smoke stack, the tug sits on the seafloor as if still making way to the next port. Humble, yet powerful, tugs provide aid to vessels in distress, tow barges to move commodities to markets, and assist ships entering and leaving ports. New Hope is a well-preserved example of this vessel class. 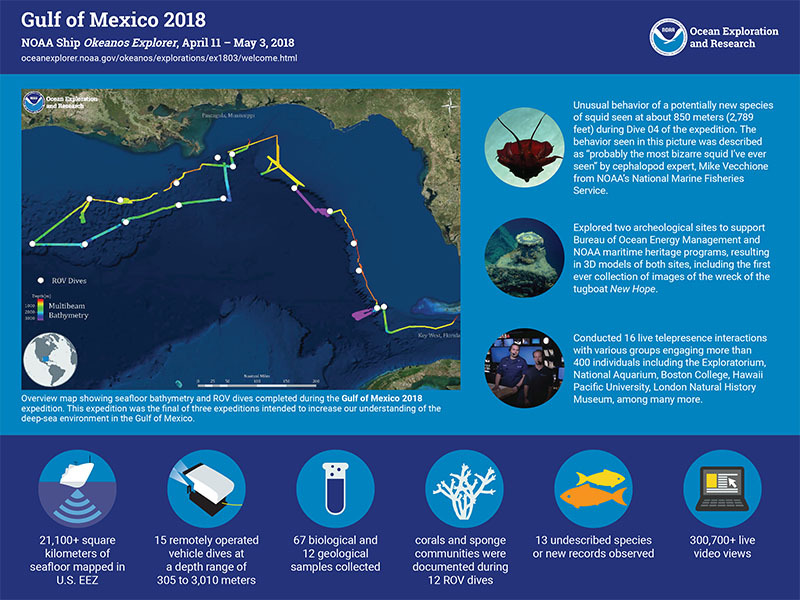 The Gulf of Mexico 2018 expedition is the final of three NOAA Ship Okeanos Explorer expeditions to the Gulf of Mexico since November 2017. This is my first time serving as the ship’s Expedition Coordinator and I am very excited about our voyage. We have a great team and on any given remotely operated vehicle dive anything can happen!